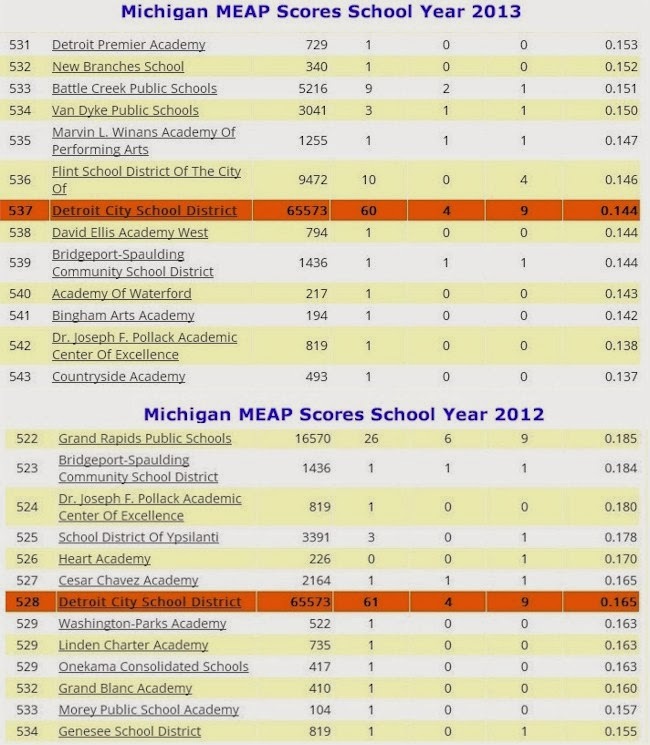 For the school year ending in the summer of 2013 Detroit Public Schools fell further behind the rest of its peers throughout the state of Michigan. This information was gathered from School Digger.com as summarized by the chart below. The decline at the Detroit Public Schools has not stopped and if Detroit is going to become a top city again it must consider drastic change as suggested in Shadow Detroit Public School Board. The proposal is far from perfect however it is a starting point. It is good that Michigan, through the EAA, is interested in improving the schools, but it is a big mistake to not have local individuals, parents and teachers, a say in what is being done. After all, sooner or later the EAA is leaving Detroit and it is still the parents and students who have the most to gain or lose. The chart below summarizes the decline. The attitude that its the EAA versus Detroit needs to end. The state must let the local community be involved. The local community must recognize the state is trying to help. Frankly, the local community should appreciate all the help, including money, that it can get.